This is the third photo gallery (see previous posts) from my visit to Kiel, on the first weekend of the 136th Kiel Week. The Kiel Week (German: Kieler Woche) or Kiel Regatta is an annual sailing event in Kiel, the capital of Schleswig-Holstein, Germany. It is the largest sailing event in the world, and also one of the largest Volksfeste in Germany, attracting millions of people every year from all over Germany and neighboring countries. The first weekend of the Kiel Week, the famous Naval Base of Kiel, opens its gates for just four hours per day, for thousands of tourists who are eager to visit the German Navy warships and dozens of foreign warships which visit the city of Kiel, to honor the Kiel Week. Note that the majority of the visiting warships had returned from the NATO BALTOPS (Baltic Operations) Exercise, an annual joint, multinational maritime-focused exercise. It is designed to improve training value for participants enhance flexibility and interoperability, and demonstrate resolve among allied and partner forces in defending the Baltic Sea region. The Lithuanian Navy was represented by the N42 Jotvingis, former HNoMS Vidar (N52), a Royal Norwegian Navy Vidar class minelayer, built in Bergen in 1977, and sold to Lithuania in 2006 where she was later modernized. The ship has a displacement of 1,700t at full load and has a length of 65 meters. It can carry up to 400 mines (depending on the type) and it is armed with two 40mm guns and two M2HB 12.7mm heavy machine guns. Enjoy photos from my visit aboard this very interesting warship! The following photos were taken during my visit to Kiel, on 16th of June, the first Saturday of the 136th Kiel Week. The Kiel Week (German: Kieler Woche) or Kiel Regatta is an annual sailing event in Kiel, the capital of Schleswig-Holstein, Germany. It is the largest sailing event in the world, and also one of the largest Volksfeste in Germany, attracting millions of people every year from all over Germany and neighboring countries. The first weekend of the Kiel Week, the famous Naval Base of Kiel, opens its gates for just four hours per day, for thousands of tourists who are eager to visit the German Navy warships and dozens of foreign warships which visit the city of Kiel, to honor the Kiel Week. Note that, the majority of the visiting warships had returned from the NATO BALTOPS (Baltic Operations) Exercise, an annual joint, multinational maritime-focused exercise. It is designed to improve training value for participants enhance flexibility and interoperability, and demonstrate resolve among allied and partner forces in defending the Baltic Sea region. One of the boats were present that weekend, was one of the only two operational submarines of the German Navy today, the last of its German Type 212 class, the submarine U36. Type 212 class is a highly advanced design of non-nuclear submarine developed by Howaldtswerke-Deutsche Werft AG (HDW) for the German and Italian navies. It features diesel propulsion and an additional air-independent propulsion (AIP) system using Siemens proton exchange membrane (PEM) compressed hydrogen fuel cells. The submarines of the class can operate at high speed on diesel power or switch to the AIP system for silent slow cruising, staying submerged for up to three weeks without surfacing and with little exhaust heat. Type 212 is the first fuel cell propulsion system equipped submarine series. The U36 was laid down in August 2008 by Howaldtswerke, Kiel, launched in February 2013 and commissioned on 10 October 2016. She is under the patronage of the town of Plauen, in Saxony. Enjoy some photos from my visit! 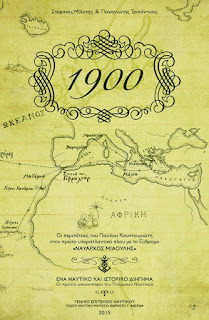 Welcome to my fourth book review, 1900, by Stefanos Milesis and Panagiotis Tripontikas. 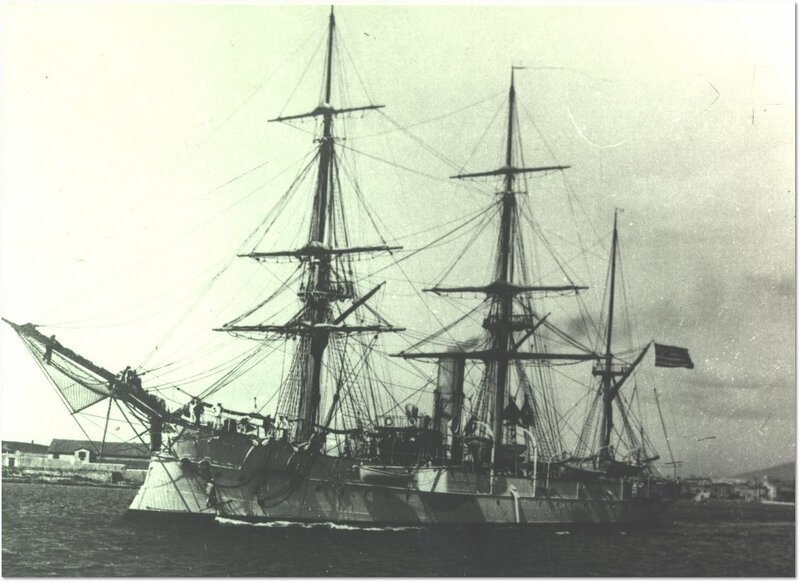 This book brings to light the crossing of the Atlantic Ocean by the Hellenic Navy masted cruiser "Navarhos Miaoulis",a voyage that broke all the records set since the establishment of the Modern Greek State! The book has not been published in English yet, therefore the review is written for Greek-speaking readers. Η πλειονότητα των βιβλίων στρατιωτικής ιστορίας αναφέρονται σε μάχες, σε πράξεις ηρωισμού σε συνθήκες πολέμου, σε πολεμικά κατορθώματα, σε εξελίξεις στον οπλισμό και τη στρατηγική. Το βιβλίο που παρουσιάζεται σε αυτό το άρθρο αποτελεί εξαίρεση. Το ιστορικό διήγημα «1900» των Στέφανου Μίλεση, συγγραφέας και δημοσιογράφος, και Παναγιώτη Τριπόντικα, Αντιπλοίαρχος στο ΠΝ σήμερα και πρώην διευθυντής του Μουσείου Θ/Κ Αβέρωφ, εξιστορεί ένα σημαντικότατο κατόρθωμα, μια πράξη ανδρείας των Ελλήνων στελεχών του Πολεμικού Ναυτικού, μια πράξη ξεχωριστή αφού έλαβε χώρα σε ειρηνική περίοδο και συνάμα ιδιαιτέρως ιστορική. 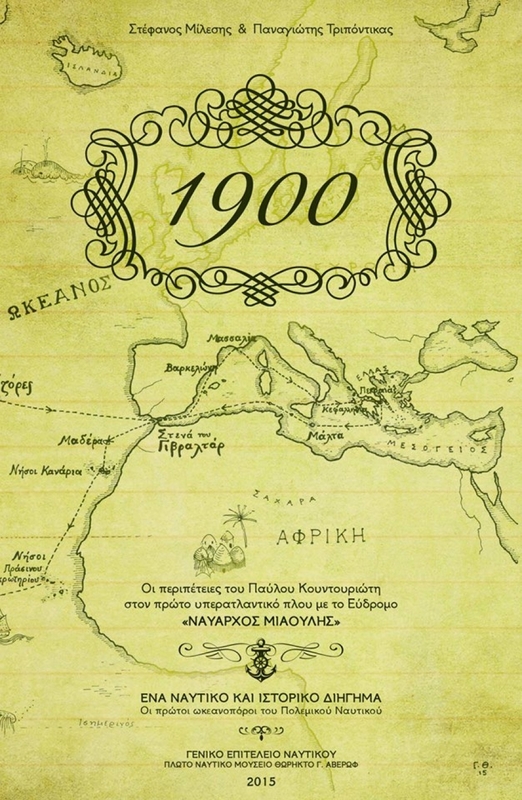 Το «1900» είναι το πρώτο βιβλίο που εκδίδεται στο είδος του από το Πλωτό Ναυτικό Μουσείο Θ/Κ ΑΒΕΡΩΦ και αφηγείται ένα ναυτικό εγχείρημα ξεχασμένο από πολλούς και παραγκωνισμένο από τις ναυμαχίες και τα πολεμικά κατορθώματα του ναυτικού της Ελλάδας, ενός Ναυτικού του οποίου οι ρίζες της ιστορίας του χάνονται στα βάθη των αιώνων της ιστορίας του ανθρώπινου γένους.